A Presbyterian pastor discovers the Catholic Church – no longer adrift | ADULT CATECHESIS & CHRISTIAN RELIGIOUS LITERACY IN THE ROMAN CATHOLIC TRADITION: hosting ONLY True Christians!! !, or "How to think Catholic!!" Dr. Joseph Johnson was raised in the Baptist tradition, but much of his formative years were in nondenominational and charismatic circles. After entering Bible college, he concentrated in church history, and spent some time among Jewish Christians due to an interest in the relationship between the church and synagogue. Having discovered Reformed theology in seminary, he joined the Associate Reformed Presbyterian Church and after seven years as a student of theology, he accepted a call to an independent, Presbyterian church as the minister. After leading this parish into the Evangelical Presbyterian Church for four and a half years, he resigned his position for financial reasons. His liturgical studies, particularly the sacraments, CS Lewis and GK Chesterton, as well as John Henry Newman and John Calvin, led him to seek full communion with the Catholic Church, into which he was received at the Easter vigil in 2013. 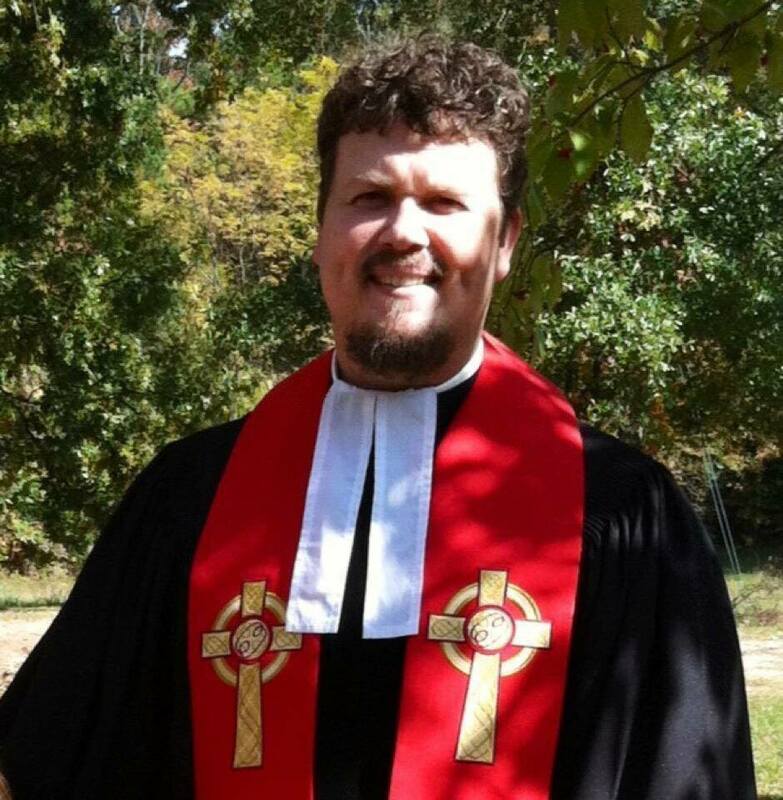 He completed a Master of Arts in Theological Studies (1999) and Master of Divinity (2004) from Erskine Theological Seminary and a Doctor of Education (2014) from Liberty University. He currently lives in Greenwood, SC with his wife and two children, where he serves as pastoral associate to the priest at Our Lady of Lourdes Catholic Church. A native of South Carolina and the last of five children, I was raised in a Southern Baptist home. My mother was brought up in the Baptist tradition; my father in the Pentecostal Holiness Church. My father was converted in 1973, when I was two, so the home that I grew up in was markedly pious—somewhat different from the generically religious home of my siblings. I was converted at a revival meeting at a Baptist church at age eight and later baptized (in a lake) at age 13. We were in church every time the door was open. My family that nurtured me in the faith always emphasized a personal relationship with Jesus Christ – to know Him and follow Him. We were part of several churches growing up, but my parents always told me to go where I believed Jesus was leading me. Of course, my working assumption was that a personal relationship with God through Jesus was all that was necessary to go to heaven as such, so whatever church you belonged to was irrelevant. The church is the people – not the building or denomination. I had no reason to think otherwise. I had never thought Catholics were not Christians (I had Catholic relatives)– misguided yes, but clearly part of the Christian story in which I participated. I entered Lander University in 1989 as an engineering major, though I was terrible at math. While in college at Lander University, I discovered the philosophy and religion section of the library and developed an interest in early Christianity and its relationship to Judaism. After several conversations with the PC(USA) religion professor, I made the move to attend Emmanuel College in the Fall of 1991. In my studies of church history and Judaism, I found a large Jewish Christian community in Roswell, GA that welcomed non-Jewish Christians. These Christians receive various non-flattering labels as many others consider them to be theologically confused. Yet, something resonated in me, considering the fact that Jesus and His disciples were Jews and practiced Judaism. The non-Jewish worshippers in the synagogue were invited (never compelled) to adopt the customs of Judaism. So I lived my life as much as possible as a religious Jew, who believed in Jesus. These studies were interrupted by what St. John of the Cross called a “Dark Night of the Soul.” During my time in college, I began to evaluate my own beliefs. In this conservative, Pentecostal college, my beliefs were challenged. I was wrestling with issues about biblical inerrancy, historic and Reformation theology, and existentialism. I had begun to read on my own (contrary to my professors’ advice) the “Makers of the Modern Theological Mind,” Schleiermacher, Bultmann, Tillich, Bonhoeffer, Heidegger, Nietzsche, the Neibuhrs, Brunner, Barth, Moltmann and Pannenberg. I had become convinced that the Bible was historically inaccurate and unreliable; I denied original sin, and embraced a modalist view of the Trinity and Kantian skepticism. As my theological and philosophical views were becoming increasingly existential and neo-orthodox, my fundamentalist social mores were giving way. I started drinking, smoking and used prolific profanity. I became quite the social and moral libertine, believing all along in the goodness, innocence and responsibility of man – I was none of those things. However, it was C.S. Lewis that helped me out of that quagmire of disbelief. Like Lewis, I came to believe in God again, but I no longer considered myself an Evangelical, and I still held onto a mild observance of my Jewish ritual life. This slowly changed in the Fall of 1995 when I enrolled at Erskine Theological Seminary pursuing a Master of Arts in Theological Studies. In the Spring of 1996, I married my college sweetheart Toby Hall. God put up with my theological arrogance until the Spring of 1996, when I met the new theology professor. We developed a great friendship and his courses challenged my liberal opinions. This was the beginning of my journey into the Reformed faith. In my pursuit of theological roots, I listened attentively to my Reformed professors, and my wife and I joined the Associate Reformed Presbyterian Church in 2000. Our daughter was baptized in 2000 and I joined Second Presbytery in 2001 as a student of theology. I was working on my Master of Divinity at the time. In 1997, my wife and I had been consulted on curriculum considerations for the religion department at a local Christian school. We joined the faculty there and wrote and taught the curriculum. We taught Christian (and non-Christian students) of many faith traditions. My time with Nietzsche and seminary helped me teach students the various beliefs of not simply their fellow Christians, but also different religions. Of course, the driving impulse for a nondenominational Christian education was C.S. Lewis’ “Mere Christianity.” Lewis’ analogy of the Christian religion was a house with many rooms. Each person should be convinced in their own mind of the room to go in, and pray both for those who are not in the house and also those who often remain in the hallway. I climbed to the chair of the religion department and held that position for almost ten years. The school was non-denominational with over 80 churches represented. I taught several courses including Apologetics, the Gospel of John, Dating and Marriage, Logic and Christian Foundations. However, life for me there became increasingly difficult. I served on the curriculum philosophy committee and I had become convinced that “classical Christian education” was the best way to educate children. In the Fall of 2000, three months after the birth of our daughter, my wife experienced significant health challenges, was hospitalized and we almost lost her. God was gracious; she recovered with some residual effects of her illness, but she began homeschooling our daughter in a classical curriculum. My Calvinism was put to the test in those trying times, but God proved Himself ever faithful. After leaving the Christian school in 2007, I eventually took a call to pastoral ministry at a nearby Presbyterian Church. Several families I knew at the parish had children who at one time had been students of both my wife and me. Due to procedural difficulties, I withdrew from Second Presbytery and was ordained by the Elders, which at the time was independent. Early in my pastorate, we voted to join the Evangelical Presbyterian Church in 2008, in which I was properly ordained in the Presbyterian tradition. It was in this year that my son was born and I had the pleasure offering him covenant (“infant”) baptism. It was during my ministry there that questions began to rise about certain aspects of my faith. There were questions of liturgy and sacraments that I spent some time studying. I was working on my doctorate of education at the time, so these theological questions were quite a nuisance. I had been confident enough as a student of John Calvin to become one of his theological heirs; however, as I prepared the liturgy week-to-week, questions continued to arise such as, on what authority did the Reformers “reform” the Mass and how do I know my parish’s liturgy is pleasing to God? I found a “high view” of the sacraments (efficacious, not merely symbolic) in Calvin’s Institutes, and later discovered his view (along with Luther, Bucer and Zwingli) of the perpetual virginity of Mary. In American religion, the Evangelical community and the Presbyterian tradition specifically, there were various things happening that gave me pause to reflect. Several Reformed ministers and theologians I respected were dragged through the mud of the printing press and declared openly to be heretics by self-appointed theological judges. The blogosphere was a landmine of gossip and slander. These accusations brought to the forefront the problem of Biblical interpretation and the sufficiency of Scripture. One man’s heretic was another’s saint. I became angry and worried. The political climate didn’t help my moorings. The nation in general; conservatives and liberals in my own Reformed tradition were at each others’ throats. The Presbyterian world was fracturing into more splits as controversy after controversy began to wreck the Reformed world. Jesus had promised that the gates of hell would not prevail against the Church (Matt. 16:18) and it seemed like He was failing. To complicate matters further, I learned of Dr. Frank Beckwith’s resignation from the Evangelical Theological Society to return to Rome and the “resignation” of Dr. Bruce Waltke from a prominent Reformed seminary over interpretations of Genesis. Jesus had promised that the Holy Spirit would lead us into all Truth (John 16:13), so how did all these splits in the Christian world occur, now numbering well over 20,000 (some estimate over 35,000)? How did I know where the “Church” was to be found? By the time I resigned from my presbytery in 2012, there were 48 splits, each claiming Calvin as their founder. One writer observed 22 different issues that keep Reformed Christians out of each others’ pews. As of this writing, views of theistic evolution, homosexual unions, female deacons, charismatic gifts, exclusive psalmody (in worship), liturgy, music styles, etc., only add to the problems and all using the same Bible. I returned to my studies of Church history and started at the beginning: the apostolic fathers and Church fathers – both east and west and the development of the canon of Scripture. I was shocked by the letters of St. Ignatius of Antioch; though I had read them 20 years before, I never read them with Reformed glasses. There was nothing in those letters that sounded at all Presbyterian! In AD 95, why was Clement of Rome bypassing the authority of the Apostle John to settle a matter of discipline in the Church at Corinth, claiming the authority of Rome to be that of God? The more I studied the more I felt drawn but kept saying “This can’t be right.” So, I sought the wisdom of friends and mentors alike to help steer me through these troubled waters but on whose authority should I accept their observations or interpretations correct? In 2010, my daughter and I attended the confirmation of a friend. I remember being impressed with the amount of Scripture heard during the Mass. I had been working on liturgical studies, so I was shocked at how similar the mass was to the Reformed liturgy at my parish. In the middle of 2011, I read John Henry Newman’s “Development of Doctrine” and G.K. Chesterton’s works on his conversion. They both were Anglican converts to Catholicism and I wanted to know why. In the process, I learned of C.S. Lewis’ devotion to Mary, belief in purgatory and his habit of praying the Rosary, but yet, he never became Catholic. In the middle of Deacon and Elder training, I found myself no longer satisfied with “our answers.” I could not find the favorite “solas” of the Reformation anywhere in the Church Fathers. In the process of looking for a way out of these conundrums, I stumbled upon the “Called to Communion” website and was taken back at how these graduates of Reformed seminaries could become Catholic. About the same time, blogger friend of mine Devon Rose asked me to read a manuscript he had recently published called, “If Protestantism is True.” I read it with a critical eye, but I kept thinking to myself, “I haven’t ever thought that through…” I watched the issues of authority, interpretation, canon, the papacy and sola fide melt away. I had developed the habit of stopping by the local Catholic Church to pray. On one occasion, I walked in (Presbyterians neither genuflect nor dip our fingers in holy water!) and my eye caught the Tabernacle Lamp. I paused, and staring straight at the Tabernacle, asked out loud, “Is that really you?” The answer to that question would be a game-changer. Tears began to stream down my face as my heart comprehended what my mind could not. There were several events transpiring in my former parish in which we thought we may be closing our doors. I offered to resign in May 2012, which certainly would help with the finances and when my resignation came, I was not sure where my family would attend church. I had wanted to go back to teach and with an end in sight on my doctorate, I was looking at the college and university level. I resigned from my presbytery in July 2012 so that I would not have to be encumbered by presbytery meetings while looking for a new teaching job- wherever that might be. This also afforded me opportunity to investigate the Catholic Church. With the advice of convert Scott Hahn, we started RCIA (Rite of Christian Initiation of Adults) in the Fall of 2012 to have an opportunity to see for ourselves what the Church believed and taught; to have the freedom to walk away if we chose. I asked my parents what they thought about the possibility of us becoming Catholic. They said that if that is where the Holy Spirit was leading us, then go for it. They weren’t without some concerns, but they supported our decision. My in-laws however, prayed for our souls believing us to be joining a cult. It wasn’t a few weeks into RCIA that my heart longed for home. I began to find comfort in the Magisterium of the Church (bishops in communion with Rome), the faithful guardians of Truth, to have been led by the Holy Spirit in Councils and visible in the Papacy to preserve the identity and unity of the One, Holy, Catholic and Apostolic Church. At the Easter Vigil of 2013, we were confirmed in the Latin Rite of the Catholic Church, where I now serve as Pastoral Associate to our priest. We helped start St. Ignatius Preparatory School, an independent Catholic cottage school that focuses on a classical approach to learning. Previous Post“Loss & Gain”, Reformed & something missing…Next PostIs Christ the Way? Who is Jesus?